Prof. Dr. Rekha N. Jainis formerly head of Department of Pathology and Rognidan at Tilak Ayurveda College Pune she has also been a member of the board of studies at Pune University presently Prof. Jain is working as examiner for Graduate and post Graduate courses in Pune University and is also a research guide to MD and Ph D students in the same University. Prof. Jain has the honor of being guest speaker at institutes and colleges in USA and Mauritius and has also arranged workshops for foreign students. Dr. Nandkumar Y. Thite graduated in Ayurveda with distinction in pathology & Medicine in 1972 and secured MBBS degree in 1979 both from Pune University Dr. Thite has been teaching the subject Rogavijnan to post graduate students for the last 13 years at Tilak an examiner for Rogavijnan Vikritivijjan subject in Pune University Dr. Thite has participated in many National & International conferences of Ayurveda as well as transfusion Medicine Dr. Thite has been working as medical officer at Indian Red Cross society’s Blood bank for the last 23 years. The Science of Ayurveda originated with the need to understand and cure diseases and to maintain health for human being. The correct diagnosis of a disease is essential for curing diseases. Although Ayurveda gained tremendous popularity right from inception, its usage dwindled with the advent of branches of new medicines and treatment. This is however changing now and what was looked purely as an alternative medicine, just a few years ago, is gaining mainstream following by students and doctors; and not only in India but from all over the world. Introducing this medical science and India being the country of its origin, it has attracted a lot of aspiring doctors, and international students community here. All medical sciences focus on two aspects of disease, which are diagnosis and treatment. 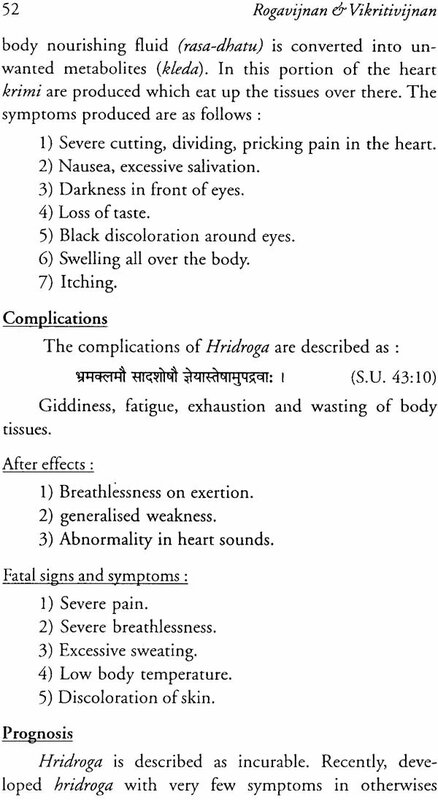 Ayurveda too focuses on these aspects and here these are called as "Rogavijnan-Vikriti Vijnan and Chikitsa". But till now they have not been looked at separately. 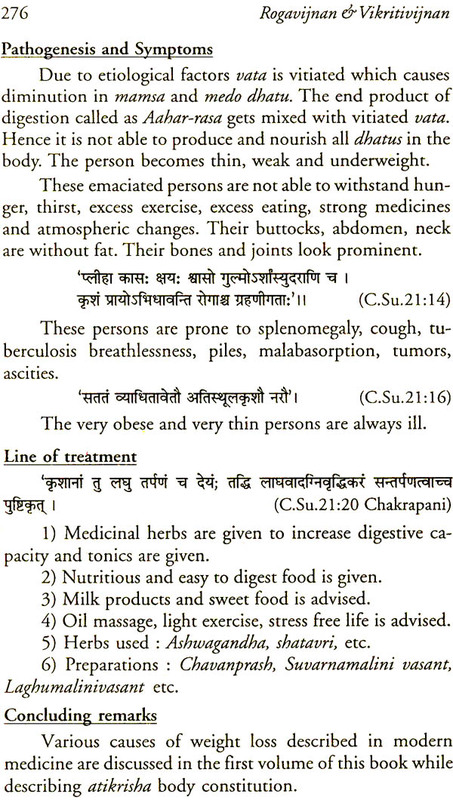 Almost all the books written on Ayurveda have included 'Rogavijnan, Vikritvijnan and Chikitsa in the same book. This is however the first time that an effort has been made to separate these two aspects and looked at each distinctly. Some books in the past have tried to deal with these topics separately but have been limited in their acceptance and scope outside India due to the language barrier. Looking to filling this gap between the international students and vernacular readers we decided to endeavour on a mission which would help us to shed light on each of these aspects separately, in international language like English and be more internationally acceptable. The text is not a mere literal translation of original Ayurvedic texts into English but an attempt is made to bring out the true essence of Ayurveda. This text book will be an introduction to Ayurveda and Rogavijnan and Vikriti vijnan for all the readers which will include students from abroad who might have science qualification and all who are keen to learn Ayurveda. This book is therefore designed as a text book for the second year students of B.A.M.S. which comes under the authority of Central Council of Indian Medicine (C.C.I.M.) and recognised by Maharashtra University of Health Sciences (M.U.H.S.). To do the justice to this mission we needed inputs not only from experts who understand these topics but also had specialised knowledge about 'Rogavijnan Vikritivijnan' and could look at it from the allpatic point of view while researching , analyzing and writing these facts. This is when Dr. Nandkumar Thite and I decided to come together and use his vast experience in allopathy and my own 30 years of experience as Professor, Researchers and Head of the Department of 'Rogavijnyan & Vikritivijnan' in the renounced 'Tilak Ayurveda Mahavidyalaya ' at Pune. While this idea was even at its budding stage Mr. Pravin Kumar Gupt from Chaukhamba Sanskrit Pratishthan, Delhi showed an interest and his support in the mission and prompted us to work on and write out this book to publish it. In this book, we have included description of 'Prakrit' and 'Vikrit' dosha, dhatu, mala according to Ayurveda, as well as the patho-physiology of these three basic elements in the initial chapter. 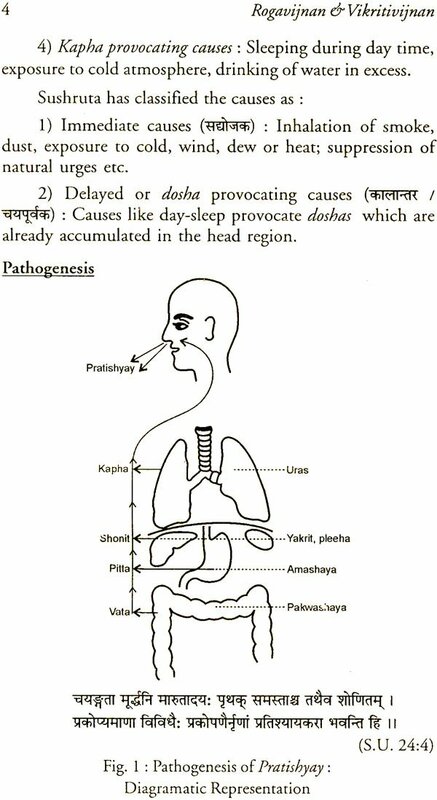 The subject of "Movements of Dosha" which has got importance in manifestation as well as diagnosis and management of disease is described in detail. The basic pathogenesis of diseases according to Ayurveda is described under the chapter of "Disease contributory factors". In the chapter of 'Systemic Pathology we have tried to explain the concept of 'Srotas' in a simplified manner. 'Agni' and 'Aam' the two specialities of Ayurveda are also made clear in the chapter of "Disease contributory factors". The two unique features of Ayurveda called 'Ojas' the vital essence and 'Vyadhi-kshamatva' or body resistance, are also considered. 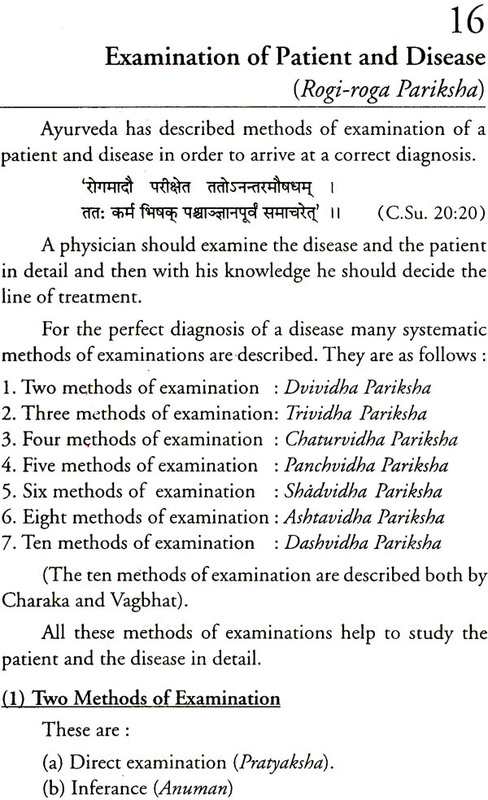 The five diagnostic criteria described by 'Ayurveda' as 'Nidanpanchak' are of prime importance in the clinical diagnosis of a disease. These are explained in detail so that students will acquire confidence in this basic subject. 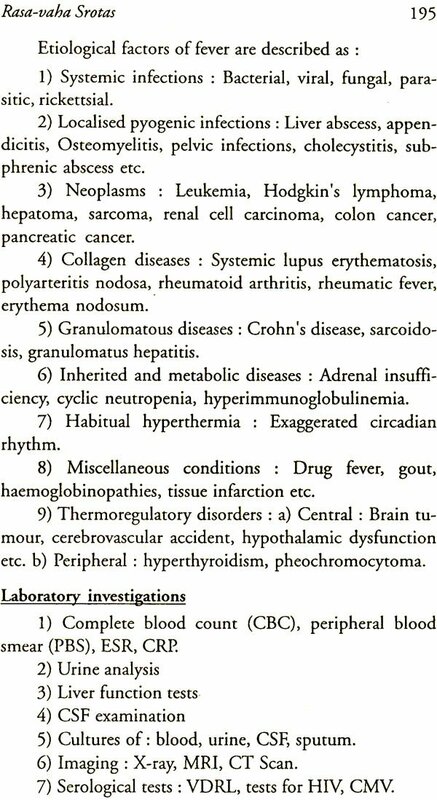 The other criteria regarding diseases such as stages, classifications, complications, death indicating symptoms, prognosis etc. are also covered in a detailed and simple manner. The epidemic and hereditary diseases described in Ayurveda are also included. Last but not least, the text has explained the various methods of examination of the patient and examination of diseases. How to prepare record of examination of patient is also supplemented in detail. This is also helpful to students for purpose of practical examination. The study of only one science is not sufficient for scientific decision. Hence a physician should have knowledge of many sciences. 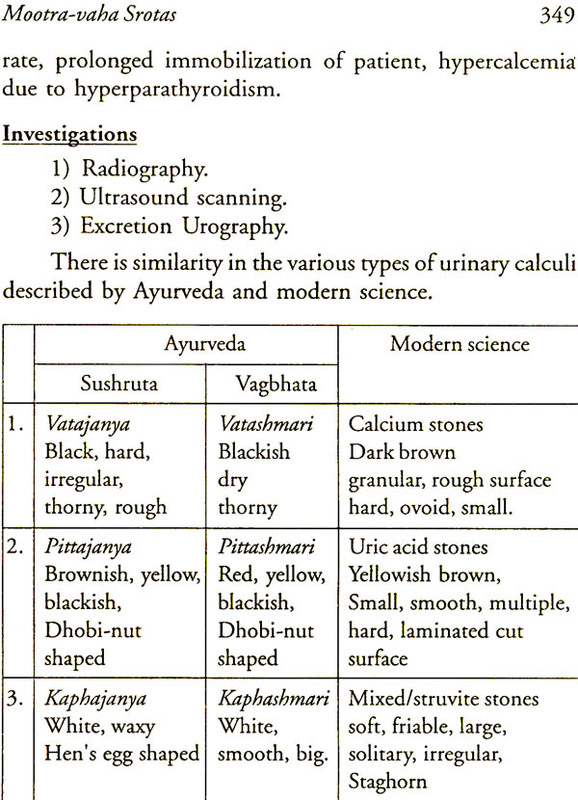 Ayurveda the science of life has described the pathology of various diseases i.e. Rogavijnan and Vikritivijnan in the era 2500 B.C. without sophisticated equipments based on physics and chemistry. The subject forms the basis of medicine surgery genecology and obstetrics hence it is essential to know why how and what about the various diseases. 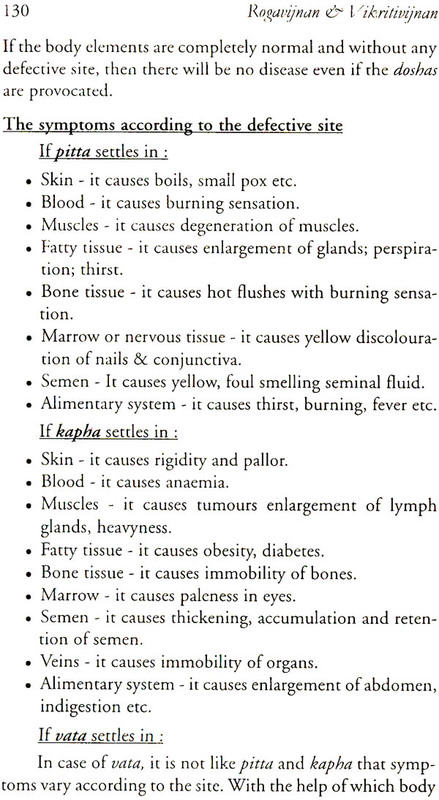 • What are signs and symptoms ? Answers to these questions means Rogavijnan and Vikritivijnan. i.e. Dosha, Dhatu, Mala are the basis of human body. The meaning of Dosha is defect actually these are three endogenous factors which govern all the body activities right from conception till death. 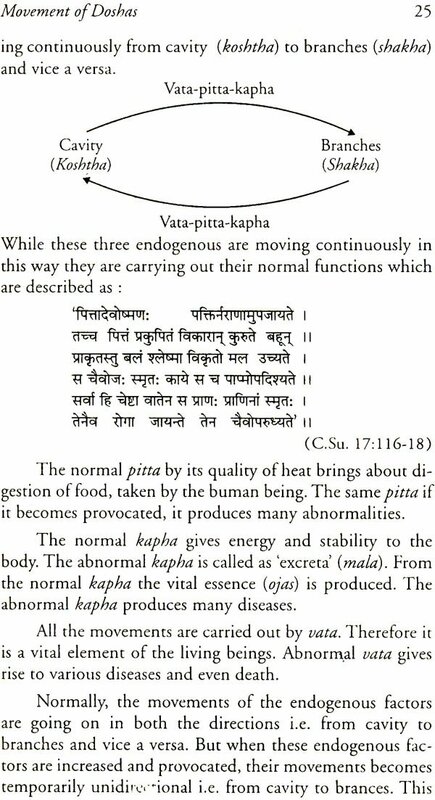 They are not having any defect but as they are able to produce defect in all the body elements including themselves they are called as Dosha they are named as: Vata, Pitta, Kapha. The meaning of Dhatu is which gives support. The human body is made up of seven body elements or tissues. They are named as Rasa, Rakta, Mamsa, Meda, Asthi, Majja and Shukra. The meaning of Mala in excretory waste product. During various body processes three waste products are produced which are excerted. They are named as Purisha Mutra and Sveda. 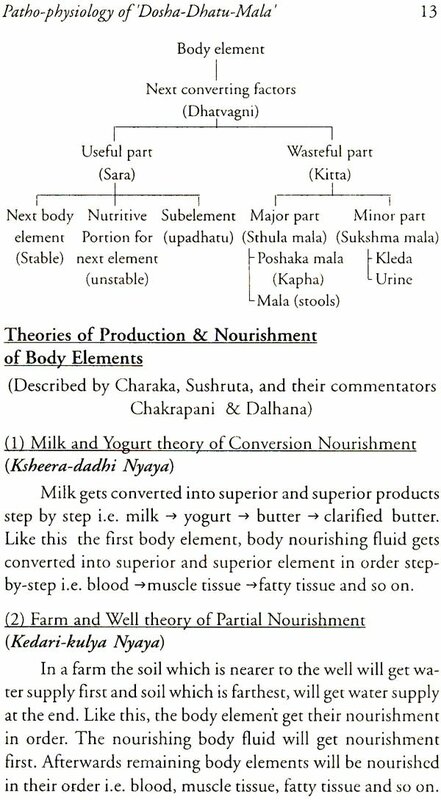 Thus the three endogenous factors or vitia the seven body elements or tissues and the three waste products form the basis of Ayurvedic physiology and pathology of human body. When the endogenous factors the digestive power the body elements and waste products are in a balanced physiological state along with well being of soul sense organs and mind then that individual is called as healthy. 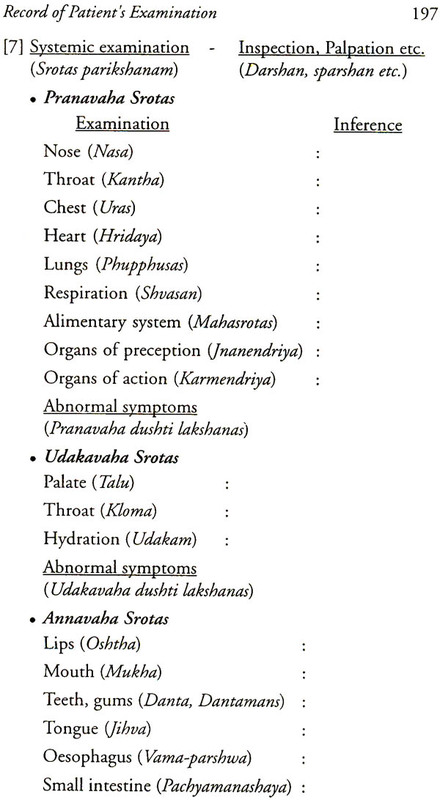 In additions the factors which affect characters of mind are also considered by Ayurveda in respect of health. They are property of purity of mind or goodness passion and delusion or ignorance. 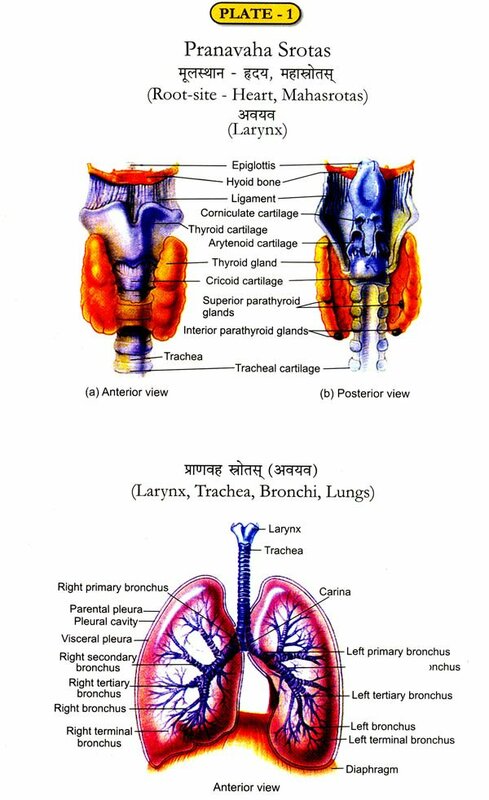 The normal balanced physiological state of the body is called prakriti or samya the abnormal unbalanced pathological state of body is called Vikriti or Vaishanya. The knowledge of physiology is essential to understand the pathological processes occurring in the body. When a pathological lesion is produced it is manifested in the form of signs and symptoms of that particular disease. 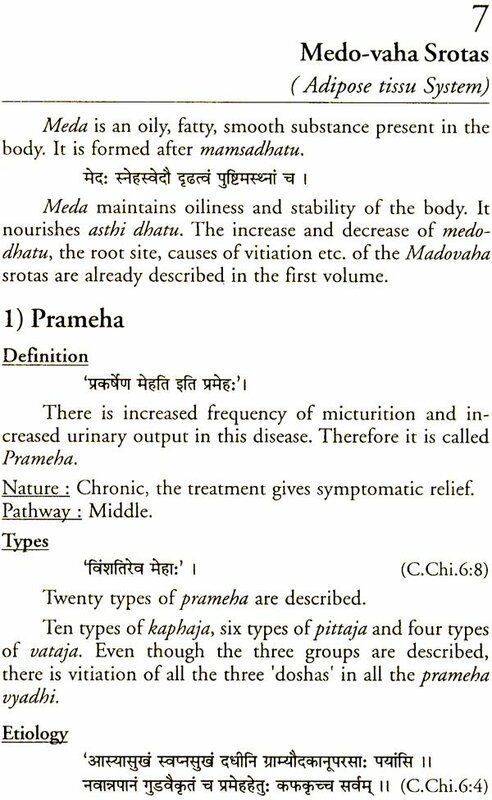 According to Ayurveda before the actual production of pathological lesion there is excessive accumulation provocation and then spread of Vara, pitta, kapha Ayurveda has described the properties functions types etc of these three endogenous factors also the signs and symptoms of their abnormality are described. All this knowledge will help not only in early diagnosis and effective treatment but also in prevention of various diseases. The progress of a disease can be arrested at an early stage. Ayurveda the science of life has described in detail about health and diseases. About various diseases it has described their etiology development signs symptoms prognosis complications etc. in detail. In the first volume of this book of Regvijnan & Vikritivijnan the concept of Srotas described in Ayurveda was considered in detail. Now in this second volume of the book the various diseases developed in strotasas are discussed in detail. While describing a disease we have covered the important point like definition anatomy and physiology of that strotas described in Ayurveda etiology pathogenesis signs-symptoms complications after effects signs of severity prognosis differential diagnosis etc. 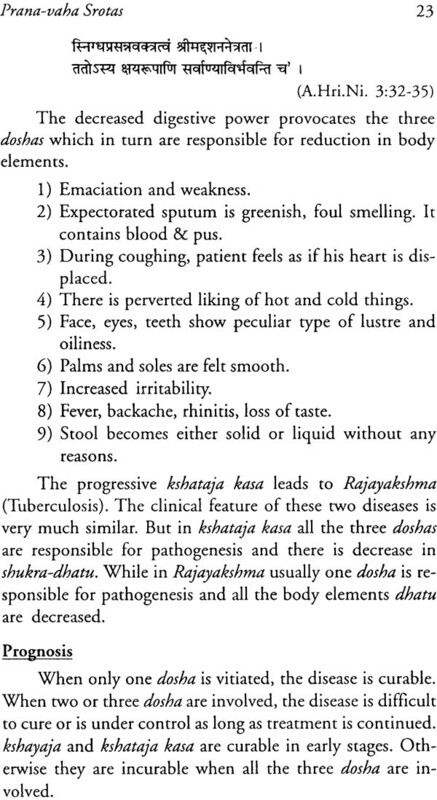 The diseases are described srotas wise e.g. pranvaha Rasavaha etc. A line of treatment alongwith do’s and don’t is also included in brief. As Ayurveda has given special importance to Vata vyadhi we have described them in a separate chapter. At the end of description of each disease the concluding remarks are given wherever possible in that the references of similar disease according to modern science are included. 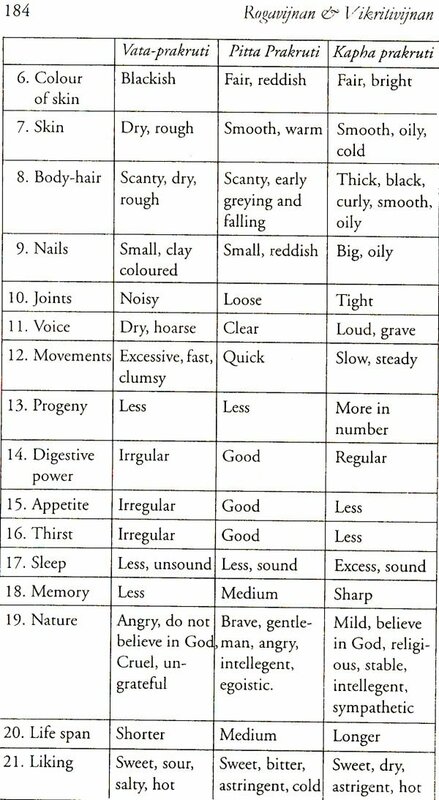 This will be helpful for the students in understanding the diseases & its comparison. The diagrammatic representation of Ayurvedic concept of Pathogenesis of a particular disease is also given wherever possible. The important investigations necessary for the diagnosis of that particular disease are also mentioned. The topic of differential diagnosis which is a little confusing portion for the students is explained in a simple manner. 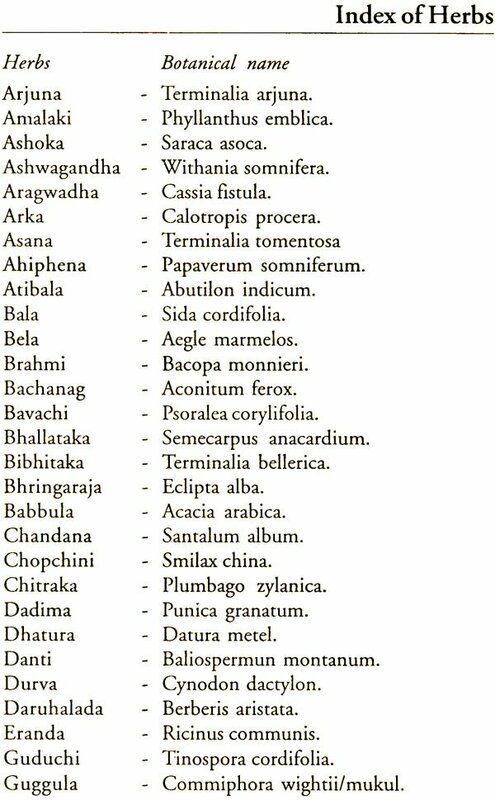 The lise of botanical names of useful medicinal herbs is also included. 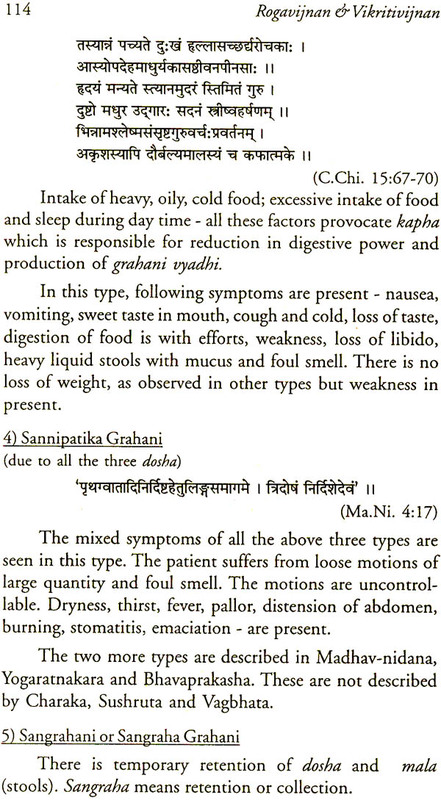 We anticipate that this description of disease will be useful for the students teachers research scholars of Ayurveda.